The Convent of the Intercession in Suzdal lies behind walls that once held captive the wives who disappointed a succession of Russia's rulers. There are rules for those who stay at the Convent of the Intercession, once the cloistered exile of the ill-fated women who disappointed Russia's czars. After you pass through a narrow stone archway, a sign spells them out: No shorts, no noise, no smoking, no photographing the nuns. Another sign admonishes you to keep out of the flowerbeds, as if the thought might cross your mind. The monastery, the Pokrovsky Monastyr in Russian, stands in a crook of the Kamenka River, 130 miles northeast of Moscow. This is Suzdal, an ancient town of white walls and bell towers, of ornately trimmed wooden izbas, or houses, and glittering onion domes, nestled in rolling fields of wheat and birch forests. This is also the Russia of history and lore, of Zhivago and Rublev, the icon painter who worked nearby nearly 600 years ago. Suzdal managed to escape the worst of the Soviet Union's rapacious pursuit of progress — and of modern Russia's uneven efforts to make amends for it. This is neither theme park nor museum piece, but a village of 12,000 working people, where chickens peck along dirt streets and cows are apt to wander in from the fields. I have traveled extensively in Russia and have not yet found any other place quite so unspoiled. One explanation for this is that the Moscow-Nizhny Novogorod railroad was laid 20 miles farther south, cutting through Suzdal's ancient sister city, Vladimir, which bears the scars of Soviet industrialization. In Suzdal, there are no train tracks, no factories with churning smokestacks, no bleak apartment blocks that mar so many historic areas in Russia. Instead, Suzdal has maintained its abundant religious architecture, much of it undergoing renovation, and is now under the protection of Russia's historic-preservation laws. And it is only a three-hour drive northeast of Moscow's congested, polluted cacophony. Even during Soviet times the authorities respected this place, despite its deep religious associations, turning the Pokrovsky monastery into a way station for foreigners escorted through the Golden Ring, an arc of old historic cities north and east of Moscow. In the early 1980's, they built 11 log houses on the monastery grounds in a 19th-century style that, like the country's main religion, Russian Orthodoxy, the Soviet Union otherwise seemed bent on obliterating. The collapse of the Soviet Union allowed the nuns to return to the monastery, reviving a community founded nearly 650 years ago. Inside the fortresslike walls, you can still stay in the 34 rooms of the log houses, experiencing the monastery as it once was, with the nuns carrying out their devotions, attending services inside two churches or tending the gardens and beehives in an apple orchard beneath the looming onion domes of the Cathedral of the Intercession. A millennium ago, Suzdal was the frontier of the medieval Rus, the principality based in Kiev that extended Christianity into Russia by erecting churches and establishing fortresslike settlements. In the 12th century, Suzdal was the capital of a small principality, though that capital later shifted to Vladimir and ultimately the whole region was absorbed by Moscow. Suzdal, though, remained a trading center and a religious one, explaining the large collection of churches and monasteries (five of which have resumed their missions). On a summer afternoon, I reclined in the grass on a bank of the Kamenka River and counted 19 separate steeples and bell towers, some newly restored, glistening on the horizon. The whole of Suzdal stretches barely a mile along the curving river. From the Pokrovsky monastery, everything is within easy reach on foot or, in the winter, by hiring horse-drawn sleds, which career through the snowy streets like awkward skaters. During a trip this summer, I started at the opposite end of town at the Museum of Wooden Architecture and Peasant Life, an assemblage of houses, windmills and churches surrounded by wooden walls, like the Russian villages of centuries ago. Many of the buildings were relocated, saving them from destruction in other towns nearby. Among them is the Transfiguration Church, built in 1756, its walls and domes covered with shingles. The most striking thing is that this is the new part of town. Across a footbridge, the earthen rampart encloses the city's ancient fortress, known, like the more famous one in Moscow, as the Kremlin. The Cathedral of the Nativity of the Virgin, a white-stoned church with its five blue domes specked with golden stars, is the oldest building in town, begun in the early 13th century, before the Mongols arrived. The church still has its medieval doors of etched and gilded copper plates depicting scenes from the New Testament. Most of the Kremlin's buildings date back to the city's time as a monastic center under the patronage of czars like Vasily III and Ivan the Terrible. Across a manicured square, a complex of buildings includes a bell tower that is connected by an arched passage to two buildings, including the Archbishops Chambers, once the home of Suzdal's clergy, and the refectory. The former now houses the History Museum, displaying an extensive collection of artifacts, including a stone cross from the Pokrovsky monastery so intricately carved that it is displayed with a magnifying glass to allow one to see stories from the life of Jesus. A short walk from the Kremlin, on Torgovaya, or Trade, Square, a pillared building houses stores and restaurants, some rather shopworn. The most interesting place is the cramped tasting room of the Suzdal Mead Factory, which makes a staggering variety of mead, the medieval, mildly alcoholic honey-wine, which is sold across Russia in squat brown bottles. At communal tables, you can sample 10 varieties at a time, served at near room temperature. Each is spiced with a different flavor, including hops, juniper, lime blossoms, pepper and, a personal favorite, horseradish. The equivalent of under $20 allowed me to wander out feeling a bit heady. Its main church, the Cathedral of the Transfiguration, despite its seven domes, is less interesting than some, but inside, restored 17th-century murals cover the walls from floor to ceiling in brilliant hues of blue, red and gold. The evening I visited, a monks' choral group walked silently to the apse and began to sing. It was a brief performance — only three songs — but the timbre of their voices, reverberating in such a place, was haunting. 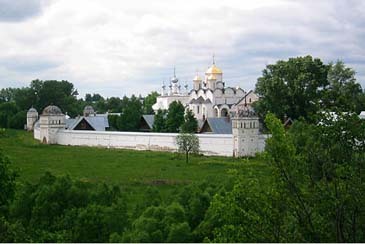 From the monastery's walls, there is a terrific panorama of the Pokrovsky monastery, surrounded by fields. It was to this monastery that Vasily III, the Grand Prince of Moscow, banished his first wife, Solomonia Saburova, in 1525 because of her supposed infertility. She had his son anyway after she arrived and staged a mock burial, lest he face a challenge from Vasily's son by his second wife. That son went on to become Ivan the Terrible, who later banished one of his wives, as did his son, and on and on until Peter the Great exiled his first wife, Yevdokia Lopukhina, who is said to have lived lavishly in Suzdal. The rooms in the log houses that are arrayed in a circle around the two main churches are not luxurious but cozy, with quilted beds, lace curtains and, in some, ornately tiled stoves that warmed the rooms wonderfully. In the morning, we woke to the cathedral bells tolling. Perhaps it was the rules, or the serenity, but after the bustle of modern Moscow, it seemed possible to imagine a Russia of another time. A direct train to Vladimir, the largest city near Suzdal, leaves Kursk Station in Moscow at 6:04 p.m. daily. Tickets cost 350 to 594 rubles each way, about $13 to $22 at 27 rubles to the dollar. Cheaper, slower commuter trains — or elektrichkas — leave six or seven times a day from Kursk Station (150 to 172 rubles). From Vladimir, regular buses travel the 23 miles to Suzdal; the fare is 30 rubles. Or you can hire a taxi and haggle. I would try to pay as little as 500 rubles, but be prepared to pay up to double that. The Hotel Pokrovskaya (7-492-312-0908; online at suzdaltour.ru/en/hotel-02-numbers), inside the Pokrovsky Monastyr, has 34 rooms or suites with breakfast for 2,100 to 3,200 rubles. A short detour to Bogolyubovo, just north of Vladimir, will take you to one of Russia's most beautiful and famous churches, the Church of the Intercession on the Nerl. It was built in 1165 on a hillock where the Nerl and the Klyazma rivers meet, and they often flood in the spring creating the image of the church floating on water.